Twenty – two attended our first meeting of 2008. President Mike Shaw announced that he had again spoken with Al Tafazoli, Chief Safety Engineer for the State of California . They tentatively set up a “cracker barrel” meeting for May to discuss the impact of the (anticipated) adoption of the ASME A17.1-2004 Code by the state, replacing the present (1996) version. Treasurer Stella McIntosh provided copies of her report for all who desired them. 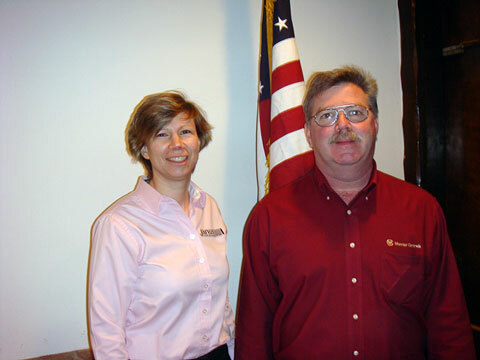 Our presentation was from Patricia Seniw , VP Sales and Marketing for Janus Elevator Products, Inc. and Tom Warmingham, Regional Sales manager for Monitor Controls. Patricia explained that Janus Elevator Products is a member of the Halma Group. Halma is a holding company with some 45 units, including Janus. Halma is traded on the London Stock Exchange. Janus Elevator Products includes Monitor Controls, E-Motive USA, TL Jones Microscan, Electronic Micro Systems and VPP Vandal Proof Products. 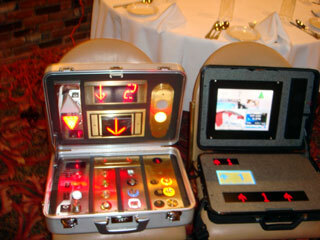 Patricia showed us a video of the latest Janus door edges, which include built in red-green signal lites . “2D” and “3D” designs are available. Very interesting and informative presentation! Everyone in attendance received a “Janus” tee shirt and luggage tag. Thanks Patricia and Tom! The meeting concluded with our fabulous raffle for prizes provided by John and Doris Brannon, Jack Lawson, Stan Schultz, Harvey Ledesma, Allan Lloyd of DRAKA, Gerry McKinnon, Mary Thomsic of ALPS Wire Rope and Mike Shaw of LERCH BATES. Stella McIntosh, Tim Hawkins, Jack Lawson, Andrew Ryan, Andy Duzich, Dave Altman, Stan Schultz, Mike Shaw and Steve Grainer. This months attendance prize, provided by the Group, went to Andy Duzich. You are currently browsing the Elevator Industry Group Of Southern California blog archives for January, 2008.